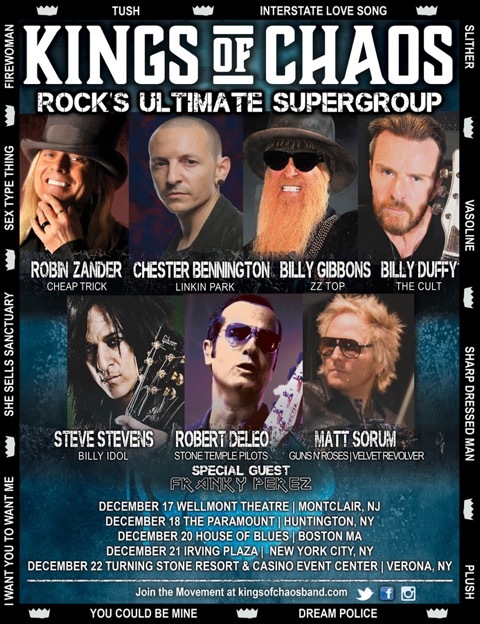 Supergroup Kings of Chaos have a announced a string of east coast tour dates beginning December 17th in Montclair, New Jersey. Following a mini-residency at the House of Blues in Las Vegas December 1-3rd, the east coast run will feature former Guns N’ Roses and Velvet Revolver drummer, Matt Sorum, Linkin Park vocalist, Chester Bennington, Robin Zander of Cheap Trick, Billy Gibbons of ZZ Top, Steve Stevens, guitarist for Billy Idol, and Robert DeLeo, bassist of Stone Temple Pilots. Tickets are available at kingsofchaosband.com.